Compare 2006 Hybrids - Honda Civic Vs Toyota Prius. Just one of the many things possible with the 4-Car Compar-A-Graph! FX enters the year with an exterior facelift with new grille, bumper, wheel design and three new exterior colors. In addition, all FX models add numerous standard features, including a 300-watt Bose audio system, RearView Monitor, 7-inch color display, Advanced Air Bag System (AABS) and more. The FX is again available in both FX45 and FX35 designations. The all-wheel drive FX45 comes with a standard 320-horsepower 4.5-liter DOHC V8 and includes new 20-inch wheels and tires, leather-appointed seats and a revised sport-tuned 4-wheel independent suspension with new dampers. 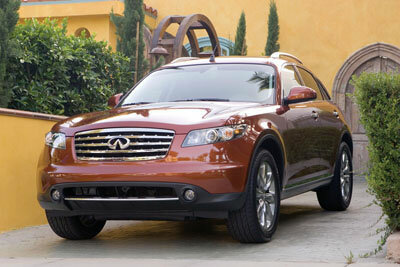 The FX35 features a 280-horsepower 3.5-liter V6 and is available in all-wheel or rear-wheel drive. All FX models utilize a modified version of the advanced FM (Front Mid-ship) platform, enhanced for SUV duties, which positions the engine behind the front axle. This results in an optimized front-to-rear weight balance of 52:48, which factors in weight transfer during key handling maneuvers, such as entering and exiting corners.